BigRep True Berlin Colour PLA is perfect for everything from prototypes to art projects, end user parts to rapid tooling applications. This filament extrudes very well between 190ºC and 225ºC and has very low moisture absorption. PLA (Poly-Lactic Acid) is a thermoplastic aliphatic polyester derived from renewable sources, such as corn, cassava, sugarcane, cereals, or sugar beet. By being derived from biological resources, this type of thermoplastic can be biodegradable under the right conditions. Therefore PLA has a reduced environmental impact compared with other thermoplastics that are derived from fossil fuels. PLA can be processed by Extrusion, 3D Printing, Injection Molding, film and sheet casting, providing access to a wide range of products with remarkable properties, which make it suitable for different applications. It is naturally transparent and it can be coloured to various degrees of translucency and opacity. 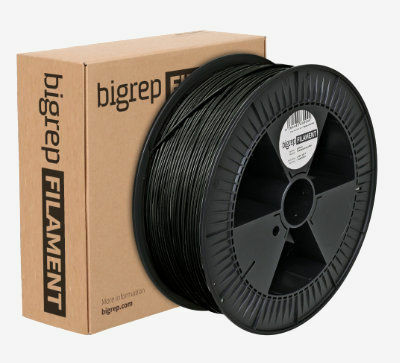 PLA is an “easy to use” 3D printer filament in comparison to other polymers. It can be printed using low to moderate temperatures and higher speed rates via FFF/FDM. The mechanical behaviour, as well as other properties of the final product, are widely dependent on the 3D printing conditions, such as extruder temperature, extrusion speed, cooling system, etc. PLA compared to other polymers used for 3D printing demonstrates much less warping and for this reason, it’s possible to successfully print without a special cooling system. For applications at higher humidity (above 98%) and higher temperatures (above 60°C) other polymers should be used, such as PRO HT and PETG. Filaments should remain sealed when being stored long term in order to prevent absorption of moisture from the air. High moisture content may harm the quality of the extrusion, leading to the clogging of the nozzles, as well as bubbles and spurting.